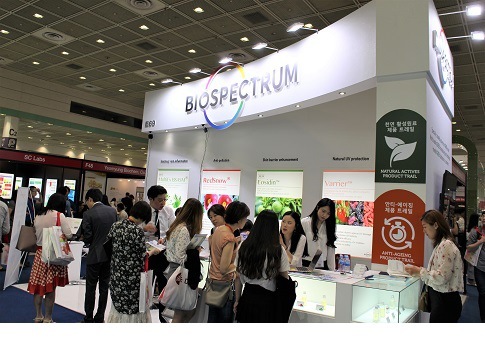 BioSpectrum attended ‘in-cosmetics Korea 2017’ held in COEX, Seoul from June 20 to 22 and introduced flagship products including Emortal Pep (Hair), Fuligo, and the new product, Eosidin. Eosidin, the active ingredient developed in cooperation with the Clariant, was first launched in the ‘in-cosmetics Global 2017’ in London, April. Customers were highly interested in Eosidin at various exhibition including ‘in-cosmetics Global’, ‘CITE Japan’, and ‘in-cosmetics Korea’, thus it is expected that Eosidin will make a successful sales in future. Eosidin is made from immature citrus fruit which is harvested in July and August. Especially, the immature citrus fruit contains much higher amount of phytochemicals including synephrine. Immature citrus extract significantly inhibited the expression of Eotaxin-1 gene and protein expression, thus atopic dermatitis symptom was greatly improved. Mostly the sensitive skin is accompanied by impaired skin barrier function. Eosidin reinforces the skin barrier function by inducing the expression of the proteins which are important for cornified envelop generation. Eosidin has proved its superior efficacy in skin inflammation and itching through various in vitro and ex vivo experiments and clinical tests. BioSpectrum differentiated it from many other anti-pollution products on the market with indoor pollution-targeted marketing. Furthermore, the buyers who have been impressed with Eosidin at the last ‘in-cosmetics Global’ in London also continued their in-depth consultation in the booth of BioSpectrum in this exhibition. Emortal Pep (Hair), one of the best product of BioSpectrum, was still popular with customers interested in hair and scalp care. It is made of naturally derived protein extracted from GMO-free soybean, and its excellent hair growth promoting efficacy was proven by in vitro tests and various clinical tests. Fuligo, the best product of BioSpectrum’s MarinEx seriese, was also popular during the exhibition. Fuligo contains oligo fucoidan which was extracted from the Tot (Hijiki) sourced from the Jeju Island. Oligo fucoidan was developed by BioSpectrum’s own technology and with this technique, BioSpectrum successfully solved the solubility, stability and activity problem of the fucoidan with large molecular weight. Many customers were introduced with Fuligo and impressed with the superior clinical test results showing anti-aging efficacy. In this exhibition, a new concept ‘Product Trail’ was introduced to make it easier for cosmetics manufacturers to find popular and suitable ingredients for their purpose. Product Trail, introduced for the first time this year, focused on three categories of natural active ingredients, moisturizers, and anti-aging actives, and selected 10 products for each category to provide the manufacturers a kind of milestone that helps to find desiring ingredient. Fuligo and Emortal Pep (Hair) of BioSpectrum were selected as the ‘anti-aging active trail’ and the ‘natural active ingredient trail’ in this exhibition, respectively. 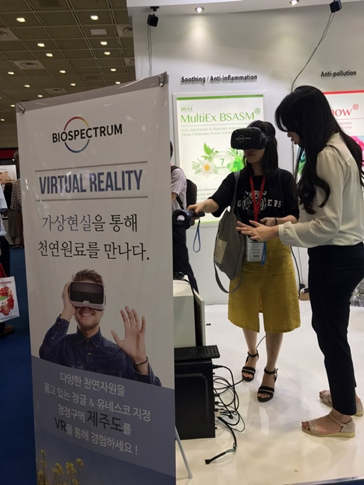 Meanwhile, BioSpectrum was the first domestic active ingredient company installed virtual reality (VR) technology in their booth during the exhibition. With VR, many visitors experience the citrus farm in Jeju Island, BioSpectrum’s Jeju production center, and beautiful scenery of Jeju Island and expressed many good feedback.